The Windows RT environment (the old “metro” for those of us who liked that name) is a rather elegant and clean interface. 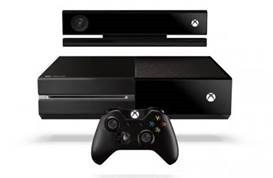 It is one that lends itself to a variety of devices, from smartphones, computers and tablets and the video game consoles, specifically, the XBOX. During the last E3 game conference, Microsoft demoed ‘Smartglass’, its answer to the Wii-U and other handheld and console combos, like Sony’s ill-designed Vita and PS3. In a nutshell, Smartglass is a means to present secondary game play or other information from the XBOX to a second screen. It also lets you remote control your XBOX. 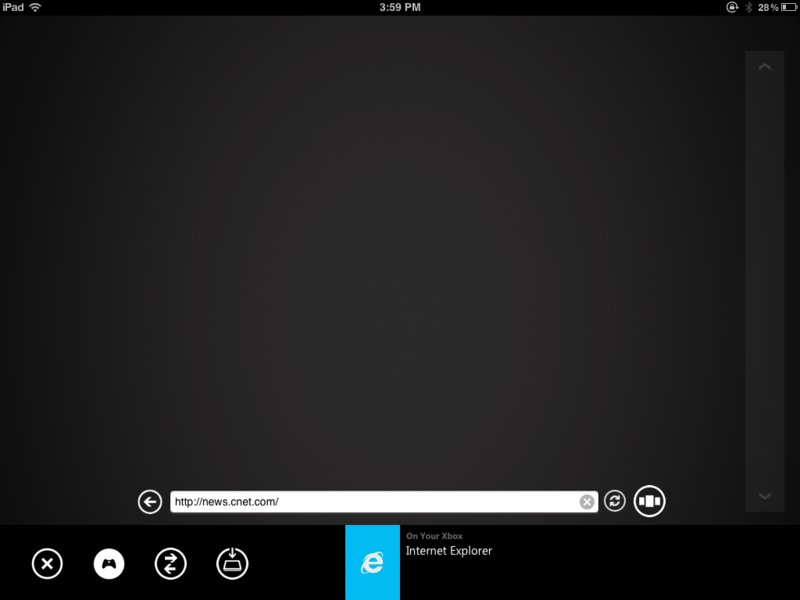 At is simplest level, Smartglass is an application that works with the XBOX. There are version for Windows 8, Windows Phone 8, iPhone and iPad and Android. You can get the app from the respective app store. Windows 8, during install, however, found my XBOX and automatically configured Smartglass. I also checked out the iOS version for iPad. Boy, the Windows RT environment would work very, very well on iPads. Forgetting for a moment that I was actually using RT on an iPad, I was really drawn into the application and found myself doing things that are actually easier with Kinect or a controller, like navigating the XBOX dashboard. Since I do not yet have any SmartGlass enabled applications, I was limited to checking out things like the new browser and getting stats and other information. Using the iPad as a remote control was pretty cool and really useful for text entry since it will take advantage of the iPad on screen keyboard. The new browser for XBOX is nice. I was able to browse to sights I visit the most, like Facebook, the Verge and my own blog. Each rendered correctly and videos played correctly. Using Smartglass on iPad made browsing really easy..but..here’s the thing, if I want to browse, I’m probably going to actually use the iPad for browsing and not the XBOX. However, the browser does open up more content for your big screen (like Vimeo and the commercial networks) so it does have SOME utility. And, if you do not have a secondary device, you CAN use the controller to enter the URL, but it is a pain. 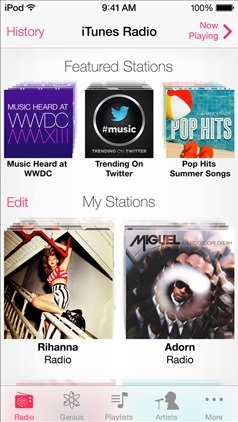 You can use Smartglass to set up favorites and pin them to the dashboard and THEN use the controller. 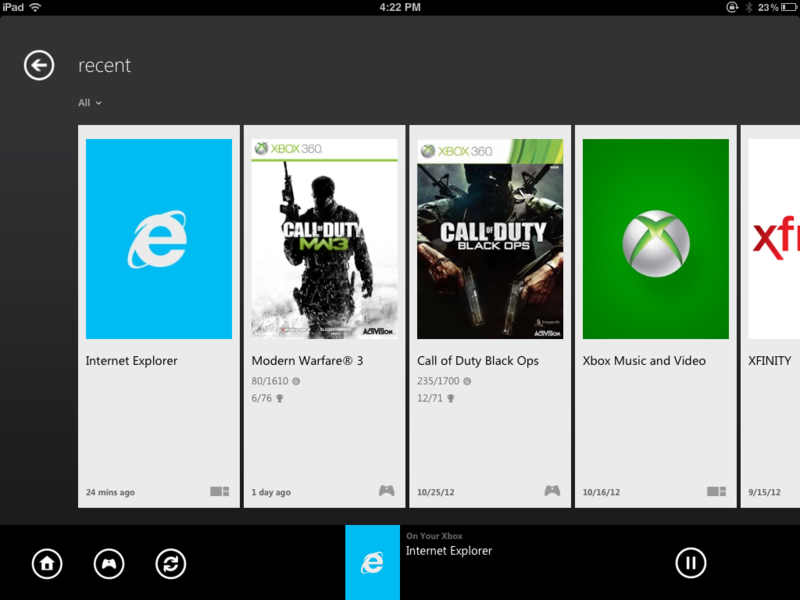 O ne of the things Smartglass will do is show you your most used/played games and apps. The recents page will show you played or used recently and you can tap on the tile to restart the app or game. Smartglass really shines with the XBOX store. 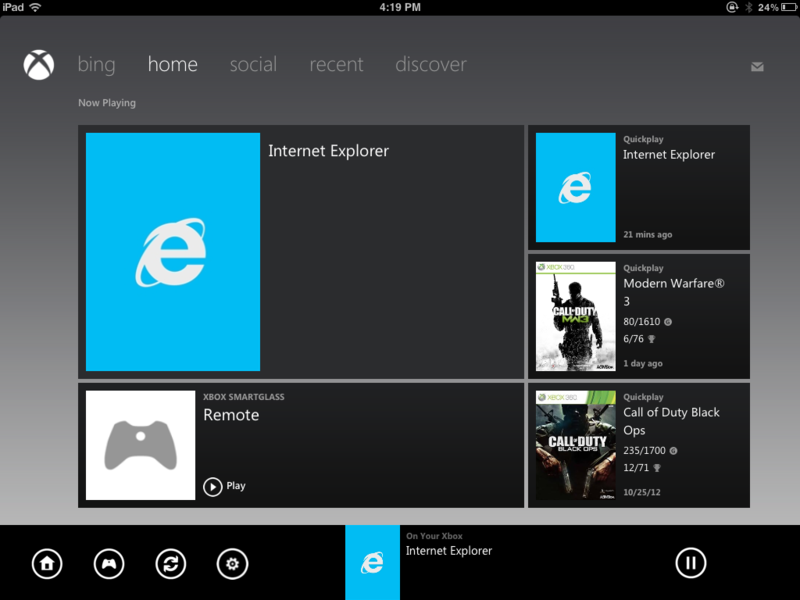 You can browse the store on the secondary device while the XBOX is doing something else. 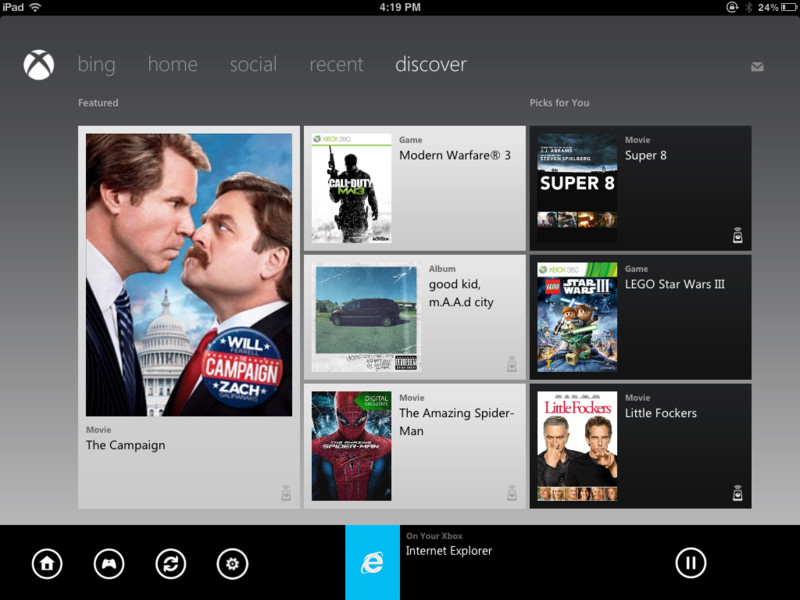 You can purchase music, apps or video in Smartglass and it will show up on the XBOX. Smartglass also lets you manage your XBOX account and avatar. 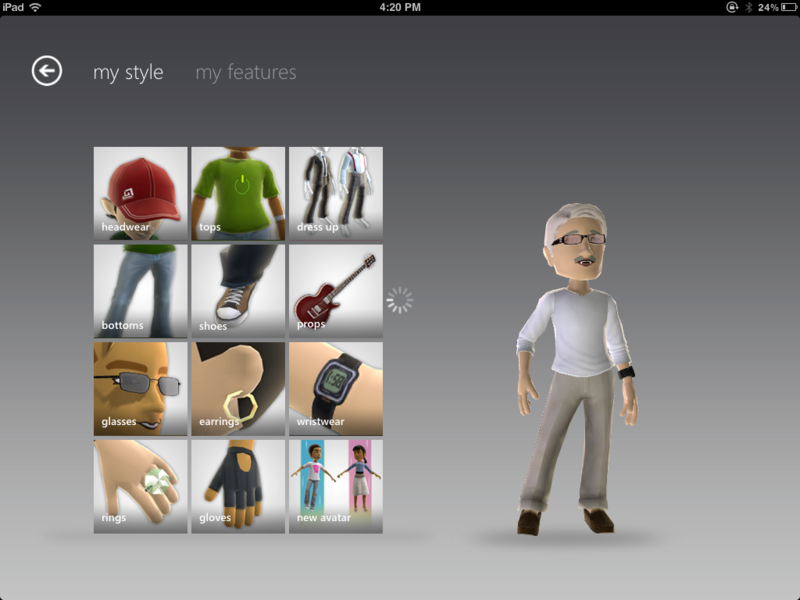 You can customize your avatar on the iPad and it is updated almost immediately on XBOX. I think I prefer this over customizing the avatar directly on the XBOX. I can use the funky XBOX controllers for games, but anything else? Forget it, I have the worst time. Using touch on the iPad is more intuitive and convenient. 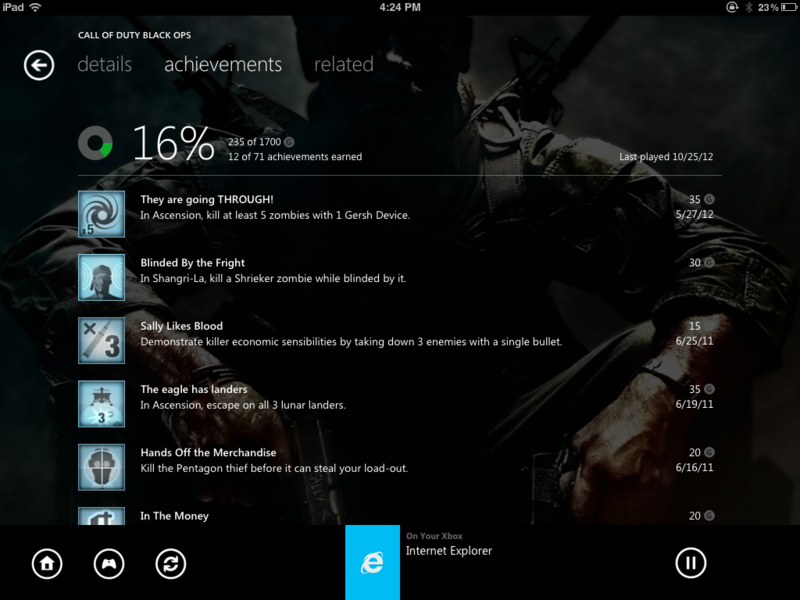 Perhaps the easy access to your gaming achievements is the coolest thing about Smartglass. You get complete breakdowns, by game, of all of your XBOX achievements. Now, I love to play games, but stick mostly to the Call of Duty games on XBOX, but, I can imagine, others play a plethora of games so this feature is probably going to be the most important to these users. Overall, Microsoft did an excellent job of bringing the RT environment to iOS and making it useful. Smartglass is, very likely, the nicest looking and smoothest iOS app out there. And, best of all, it is free. Perhaps the biggest blunder of all: The Xerox brass not ‘getting’ what Xerox Parc had created. Xerox Parc, for those who do not know, created the graphical user interface and perfected the mouse (which was invented by Douglas Englebart at the Augmentation Research Center at Stanford in 1967.) The Parc group presented the GUI based Alto computer, the brass had no idea what it was or what to do with it. It was, eventually, marketed as the Xerox Star, it was a failure for the company as it sold about 25,000 units. While Xerox failed to capitalize on the GUI, a small company named Digital Research failed to capitalize on IBM and their new personal computer. The story goes something like this: Gary Kildall, the CEO of the company, was out flying when the IBM’ers stopped by. Kildall’s wife greeted tham and told them that Kildall was out but would be back shortly. She spoke with Kildall who instructed her to proceed with negotiations. When the IBM’ers demanded that she sign a non-disclosure agreement, she refused and they left. This story has been disputed over the years, but, the bottom line is the DR’s reluctance opened the door for Microsoft to lock up the operating system business on the IBM and its clones. Even better, Microsoft had sold IBM non-exclusive rights to an operating system that they did not own. Which, leads to another HUGE blunder…Tim Paterson of Seattle Computer wrote the initial version of MS-DOS. He bought a manual for CP\M and patterned his DOS after that. When Microsoft promised an operating system to IBM, Paul Allen went to Paterson and offered fifty thousand dollars to buy his DOS. Paterson accepted. Now, to be fair to him, Seattle Computer was a tiny company and fifty thousand dollars probably seemed like a lot for his unpolished little operating system, so you cannot fault him but so much. Still, in hindsight, this was a pretty big mistake. Next, we have Apple. They made mistake after mistake in the early years and a few very recently. Perhaps the biggest mistake that Apple made was not bringing Steve Jobs back sooner than they did. This was a company on the verge of imploding (which, oddly enough, is why they fired Jobs in the first place) when they finally brought him back. However, along the way, they: continued manufacturing the Apple II for far too long; failed to keep up with advancing technology; failed to modernize Mac OS; went through too many CEO’s; had a product line that was too big and too broad. When Jobs returned, he did turn the company around, but made some blunders on his own. Perhaps his biggest mistake was canning the Newton. By the time Jobs took over, the Newton was beginning to make a mark in the PDA world. It was facing huge competition by the cheaper, smaller and easier to use Palm Pilot and was not part of the Mac product line so, after waffling a bit, Jobs shut it down. He also killed the Mac clone business. Now, some would argue that this was not a blunder, but, I contend it was. Had the clone market been allowed to continue, Mac OS COULD have become a much more entrenched operating system and Mac hardware might have given the PC world a real run for the money. Microsoft has made more blunders than I can write about here, so I will only mention the big ones. Like the Zune. Here, Microsoft had everything going for it: great hardware, decent software, a really good marketplace and subscription plan. They were able to secure the necessary rights for music and video (and, eventually, a few apps) but what they failed to do-and failed spectacularly: advertise the thing. The marketing of Zune was abysmal. Add to that, the initial hardware looked as if it were designed by Soviet era designers of missile launchers. Then, there was the XBOX 360. 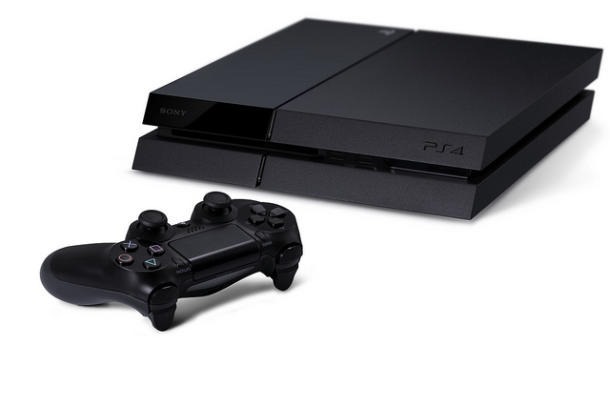 Now, I know it is a best selling console now, but this thing was a turkey in the first few years of its life. Due to a design flaw, the console would over heat and die, giving its users the ‘red ring of death.’ Microsoft made good and replaced the consoles as well as redesign the product, but it never should have happened in the first place. Perhaps the biggest blunder in recent years was that of Palm. Palm, the once shining beacon of Silicon Valley, was sold so many times and, in the process, not only lost its way (and lead) it made a series of blunders that should have killed it off years before it finally did implode. First, they failed to keep the founders of the company, who went and started Handspring and LICENSED the Palm OS from Palm. Then, Palm bought that company for far more than it was worth. Palm perfected the smartphone concept, but failed to capitalize on it, mainly because they did not update the Palm OS quickly enough. Worse, they split the company into two parts: hardware and software. The software company, PalmOne, then sold itself to a company called Access. While the hardware company maintained rights to the operating system, they had to pay Access to use it. The last device from Palm to use the operating system was the Centro, a cutesy little smartphone that was too small and too under powered. It initially sold well, but, in the end, just served to hasten the demise of the once great company. Finally, Palm hired a former Apple executive to run the company. They introduced the Palm Pre and webOS, an innovative mobile operating system based on Linux. The problem was that only Sprint carried the phone at launch. Poor hardware served to help sink the Pre, along with the ultra popular iPhone. As Palm floundered, it put itself up for sale. Hewlett Packard purchased the company and, after introducing three webOS devices, decided to can the whole thing. And, that was that. Which leads to HP’s big blunder…it was fantastic. The aforementioned acquisition of Palm led HP to announce the TouchPad tablet. The device was nice and powered by webOS. Problem was the price: it was too damn high. Not a month after it was released, HP dropped its nuclear weapon on the device: they announced that the Palm division was shutting down. 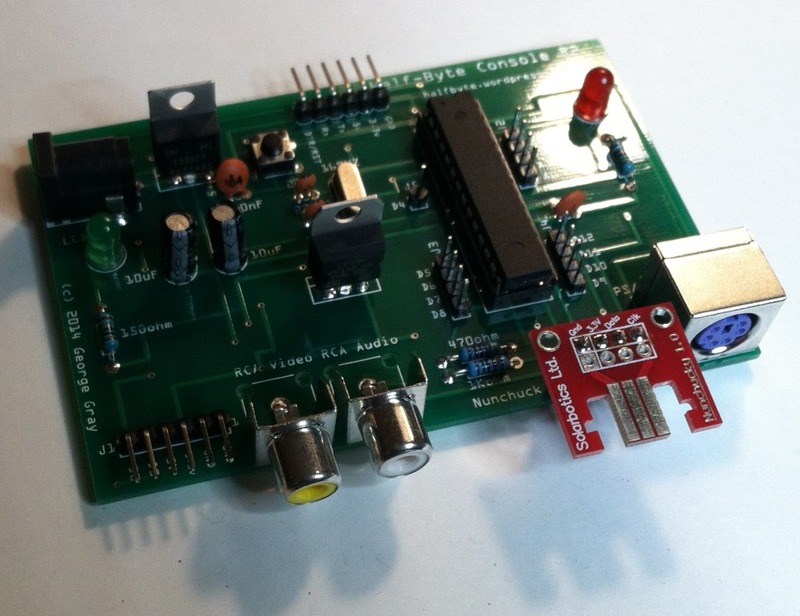 No more hardware would be produced, but existing hardware would receive support. HP had thousands of unsold devices. They blew them out at a hundred bucks each and, naturally, they sold well. For a time, the TouchPad was the number two tablet, behind the iPad. So, not only did HP tick off TouchPad owners, they ticked off OEM’s and suppliers as well. Companies that made accessories were left with stock that was now worthless. There are so many more…IBM’s failure to keep up with the PC world, New Coke, Sony’s PS3 (too expensive, too difficult to code for, billions in losses, etc.) and more. Perhaps, however, the BEST blunders, in the tech world, anyway, was not from a company, but from the government…the FCC, to be specific. First up, color television. In the late 1940’s and early 1950’s, color was the pot of gold at the end of the rainbow. Over time, two formats became the clear contenders: RCA’s all electronic color and CBS’s electromechanical format. The RCA format was compatible with the now millions of sets in use. The CBS format, however, was not. The CBS format utilized a huge color wheel that was attached to a motor. The motor would synchronize itself with the video via a signal in the video. This meant that the colorcast (as they were called) would not be able to be interpreted by the black and white sets already in use. It also reduced the resolution to 405 lines. Despite the problems, the FCC adopted the CBS system in 1950. Unfortunately for CBS, there NO sets capable of receiving the broadcasts. CBS went so far as to buy a television manufacturer to produce sets. With the goal of producing the sets in quantity, CBS failed. It became clear that the system would not gain acceptance and, to help them bow out gracefully, the government ordered that the production of the sets be halted. Only 200 sets actually shipped. 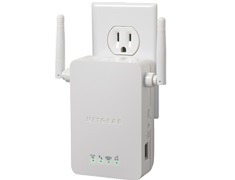 The FCC re-evaluated the RCA method and, after a few changes, it was adopted. The government lifted the production ban and, on January 1, 1954, NBC broadcast its first commercial color program, the Tournament of Roses parade. The next big blunder, again from the FCC, was AM Stereo. In the 1980’s, the FCC approved stereo audio for television and, to help ailing AM radio, allowed AM stations to broadcast in stereo. The problem, however, was that they failed to adopt a standard. There were two competing formats and they were not compatible. Radios with one format could not receive stereo broadcast in the competing format. The end result: consumer confusion, consumer ignorance (many did not even know about AM stereo) and the continued decline of AM radio. The sad thing was that both formats improved the quality of AM sound a great deal. An apathetic public just did not care enough. AM Stereo is as alive today as the mechanical television. So, the next time you make a mistake and begin to beat yourself up, just think about one of these blunders…all of which were costly for those involved. I am sure you will feel better. Since the Zune HD was released, it’s user interface has been praised. Microsoft liked it so much that they modeled the user interface for the redesigned Windows Phone operating system and, they gave it a name: Metro. Metro has a nice, clean style that is fresh and, so far, unique to Microsoft. It’s main features are its font and the live tiles. Using an oversize but clean font and not worrying about screen real estate, Microsoft was able to incorporate features that other operating systems could not or, rather, could not do so easily enough. The live tiles not only represent applications or functions, but they are also ‘living’ in that they can present information from the application or the feature they represent. Windows 8 will feature Metro and so will the XBOX 360. Microsoft announced at the E3 conference earlier this year that XBOX would get a makeover and, now, they have delivered. The refresh means that the XBOX has now gone Metro as well. 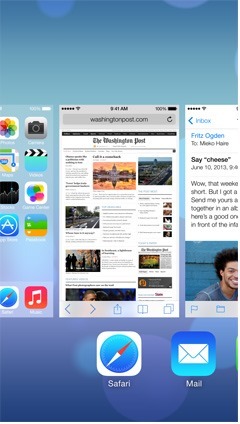 Aside from the look and feel, perhaps the most notable change is the addition of the ‘app store’. Not like the Apple App Store, but an app store nonetheless. Unfortunately, there isn’t much there yet and the ‘biggie’ apps like the XFinity and YouTube apps won’t be out until early 2012. But, the promise and capability are there and I cannot wait for the actuality of those apps. So, for what is there, how did they do? I think they did well. The system feels more stable and less hodgepodge than it did. 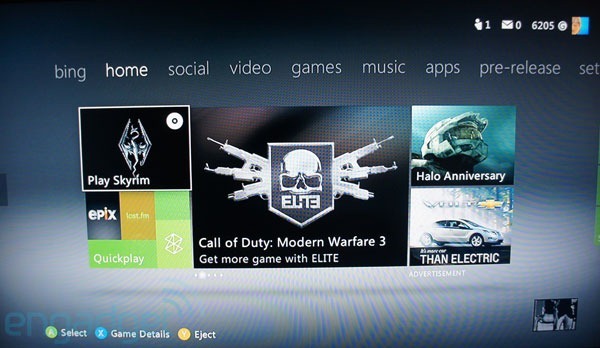 The clean design and pleasing black background as well as the replacement of the ‘busy’ cursor make the XBOX more like a family computer or media hub than a video game console. 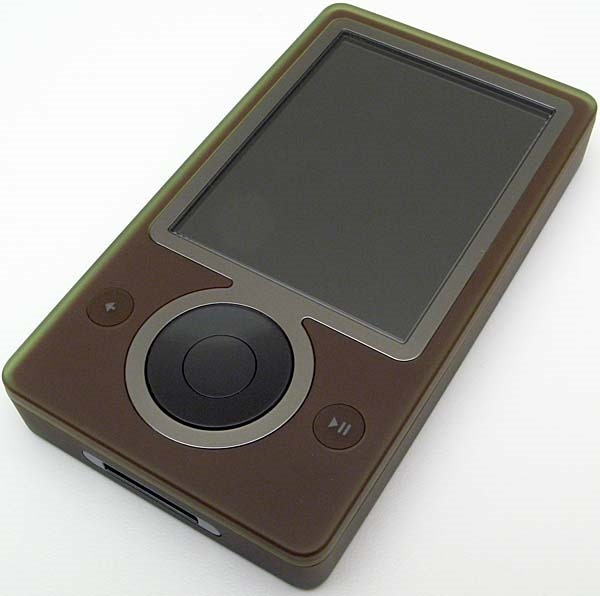 Zune integration is even better and, contrary to early published reports, the Zune brand is just as prevalent, if not more so, than it was before. The tiles, while some were still blank, are a welcome addition and I can think of a lot of uses for them. Game achievements, friends online, etc. are a few things that come to mind. Using the new interface took about a minute to get used to. It is responsive, very nice looking and easy to navigate. I think they did a better job with the controller interaction than they did with the mouse and keyboard interaction in the Windows 8 developer preview. I think the real advance for the dashboard is the Kinect integration. Unfortunately, I do not have Kinect yet, so I cannot report on that, but the demo I saw was very impressive. Installing the update took about 20 minutes and three restarts of the console, but it was trouble free-as has been my experience with XBOX on the whole. XBOX has been transformed into a powerful but easy to use home media hub. It not only has online access to Netflix, Zune and other media outlets, but it is also able to access your own media on your Windows or Mac computers, a feature that is vital to making XBOX a media hub. My one complaint is that it cannot handle as many codecs that the PS3 can, but XBOX still beats PS3 in every category. In a future post, I will discuss XBOX as a media hub. Stay tuned for that. Overall, the new update is pleasing and a welcome change to an already superb product.